When it comes to weeds, ground elder, or bishop's weed as it is sometimes called, is often condemned as gardeners' enemy number one. With its uncanny ability to spread quickly through an underground rhizome system and tendency to outcompete other plants, this weed is extremely resilient and difficult to get rid of once it has been established in an area. So could the key to beating it be eating it? Well, cooking with ground elder probably won't take care of your weed problem, but it IS a fun way to make use of an abundant and readily available plant! Plus, it makes for a zesty - and completely free! - ingredient in everything from soups to pesto. Just make sure to pick only the youngest and freshest leaf shoots, as mature leaves can be a bit bitter. If you can't find any ground elder to forage, use spinach as a substitute. Enjoy! Chop onions and garlic, then sautée in the rapeseed oil in a large saucepan until browning has started. Rinse the ground elder (or spinach if substituting) and add to the onions and garlic. Add bouillon, 1 dl of the milk and let boil under lid for a few minutes. Purée the sauce with a blender and add salt if needed. Chop walnuts and add to sauce, mix with pasta of your choice. 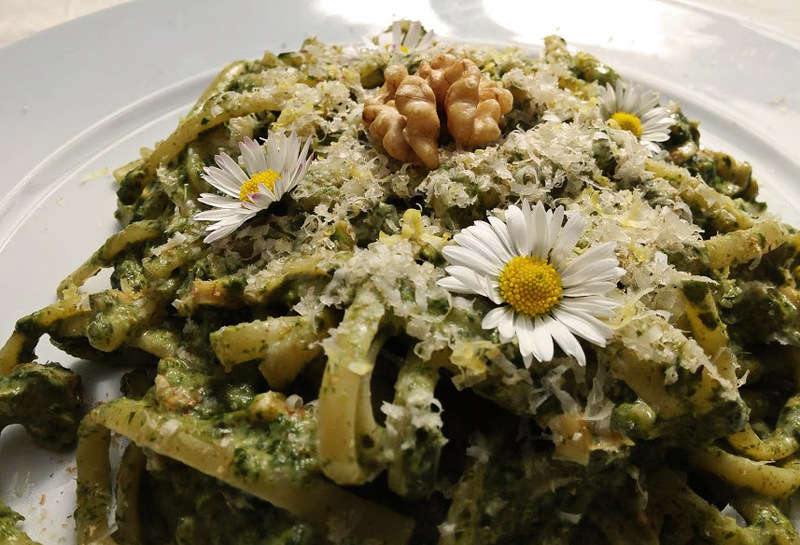 Garnish with grated walnuts, grated nutmeg and some lemon zest.